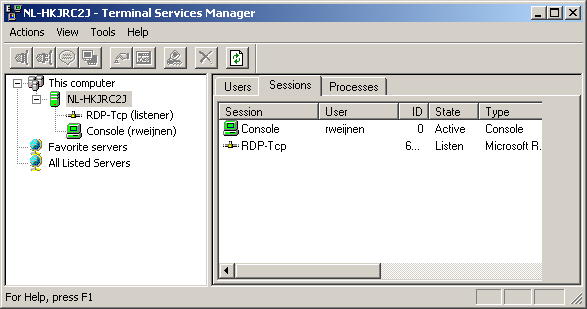 You will probably know Microsofts Tool to Manage Terminal Server, it’s called Terminal Services Manager (you will probably know it as TSAdmin). It can be used to view information about terminal servers including all sessions, users, and processes for each terminal server. I’m currently working on a TSAdmin replacement (codename TSAdminEx). Purpose is to show how to use the Terminal Server API’s and as a little bonus we will add some extra functionality to TSAdminEx. First we obtain the user’s primary access token with the WtsQueryUserToken API call. To call this function successfully, the calling application must be running within the context of the LocalSystem account and have the SE_TCB_NAME privilege (LocalSystem has this privilege by default). Since the function returns a primary acces token we can just pass this to CreateProcessAsUser and voila! 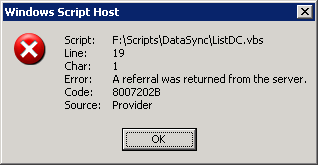 This is because the default settings for Chasing referrals is set to ADS_CHASE_REFERRALS_NEVER. Ever wondered how mstsc saves passwords? If you open an RDP file with a text editor like Notepad you can see the encrypted password. In this article I will show you how to encrypt and decrypt these passwords. Besides password recovery this enables you to create rpd files programmatically or perhaps update the password in many rdp files with a batch file. A little while ago I wrote a little commandline tool that starts an RDP connection (with mstsc.exe) because mstsc doesn’t allow you to use the login credentials (username, password) as commandline arguments. A friend bought a new Toshiba Satellite L40 laptop which came with Windows Vista preinstalled. The wireless connection (via the built in Atheros AR5007EG card) was very unstable and sometimes unable to connect to the access point. When connected internet speed was very slow, sometimes unable to open pages at all. First we tried replacing the preinstalled Toshiba drivers with the latest from the Toshiba site and later on the most recent from Atheros (which can be found here). Both drivers didn’t improve the speed.